It’s dark, it’s beautiful and it’s huge. How does the Indian Chieftain Dark Horse feel like to ride in our conditions? For most of us, the carefree glee on the faces of children in the playgrounds, fruit sellers selling bright yellow mangoes by the road and lemonade stalls springing-up around every corner signal the arrival of summers. And like each passing year, the summers this year only seem to get hotter. Try riding a motorcycle in the afternoon and you are sure to get dehydrated sooner than you would imagine. This leaves bikers with the option of either starting a ride to the nearby hill-station early in the morning, or riding on secluded city streets in the wee hours of the day. I certainly love my early morning rides in the hills, but that said, there is a strong charm to riding on the streets of Mumbai well into the night, once the roads are bereft of the city’s horrendous traffic. And when Indian offered us the new Chieftain Dark Horse, we felt riding it in the dead of the night would be the best time to experience the dark side of this touring motorcycle. It is essentially a blacked-out version of the Chieftain, and like the night and all things dark, the bike had an aura to it that made it enjoyable on the streets of Mumbai past midnight, despite its gargantuan dimensions and torquey 1800cc V-twin motor. It is easy to get awed by the sheer size of the Chieftain Dark Horse, with the bike being almost as long as some of the smaller hatchbacks on our roads. But despite its imposing dimension the Chieftain’s curvy design makes it look beautiful – even Beyoncé would get envious! The large fairing is undoubtedly a stand out feature, especially with its triple headlamps and beautiful integration of LED turn indicators. The curvy, valanced front fenders with the illuminated Indian mascot and subtle chrome trimmings are details that gives the Chieftain Dark Horse a unique visual persona. The Chieftain Dark Horse gelled well in its satin black finish with several Gothic structures from the British era in Mumbai. Its bagger-style rear with beautifully designed LED tail lamps and twin exhaust pipes exiting below the hard panniers endow the bike with an elegant derriere. Chrome elements have been used judiciously on the exhausts, as also the trimmings on the fenders, panniers and alloy wheels. Needless to say then, its large proportions and sweeping lines ensured the Chieftain Dark Horse had onlookers smitten by its beauty. In standard form, the Chieftain Dark Horse is offered as a single-seater but our test bike came with the optional rear saddle and backrest. Being a premium cruiser, it gets an electrically adjustable windscreen, semi-digital instrument console and an infotainment system that could rival the units found on many cars. The system features satellite navigation, a 100 watt stereo system with Bluetooth connectivity, USB compatibility and an AM/FM radio integrated into the fairing as well, to keep you entertained. What’s more, if you ever feel the standard speakers aren't loud enough (they are, in my opinion), you can even add a set of optional saddle bag mounted speakers! The digital screen is similar to the MID (multi information display) seen on cars, and offers details like average fuel consumption, gear position, tank range, tyre pressure, engine oil temperature, odometer, tripmeter, audio settings, ambient temperature and the like. The highlight of the display is that despite the vast amount of information it offers, the console is neatly laid out and legible. A coloured display would looked a lot better as compared to the monochrome unit though, especially given the bike’s premium pricing. Keyless ignition is standard and the owner can also start the bike using a programmable PIN entered by clicking the turn indicator switch repeatedly. The hard saddle bags can be unlocked by pressing the key fob or a separate button on the tank. Cruise control is standard, though heated grips are an optional extra. Overall fit-finish and build quality of the Chieftain Dark Horse are excellent, and didn’t really give us a reason to complain. Tap the one-touch starter, and the massive, 1811cc, ‘Thunderstroke’ V-twin comes to life with a mild roar before settling down quietly. This is the exact same motor as every other Indian cruiser, right from the Chief Classic to the Road Master, and is easily one of the most refined V-twins as far as cruisers go. Its refinement levels are brilliant, and the engine rarely let us feel a vibration. The motor develops 74PS at 5075rpm. Your first reaction might be that the engine is underpowered, but its torque output and the way the engine produces its twisting force is what is the Thunderstroke’s highlight. The engine churns out a massive 139Nm of peak torque at just 2600rpm. What’s even more impressive is that 75 percent of the torque arrives at just 1000rpm. To give you a perspective, the Chieftain had no trouble doodling at 40kmph in sixth gear, without any throttle input at all, without any knocking! That apart, the engine displayed its might in our VBOX tests, accelerating to 100kmph from standstill in just 6.78 seconds, which is impressive considering its kerb weight of 377kg! What’s even more interesting that launching the bike with the revs held to about 4000rpm had the engine send so much torque to the rear wheel that the tyre was struggling for grip, leaving long, dark lines on the tarmac! The Chieftain Dark Horse isn’t intended to scorch drag strips but munch miles on the highway, and it does the job in a splendid manner. It had no trouble being ridden at triple digit speeds and its vibration free nature ensured fatigue didn’t set in even after long hours in the saddle. The bike felt rock steady even at speeds, while the 76.2mm adjustable windscreen did its bit in reducing wind blast, without much buffeting. The engine also feels very tractable in city conditions, which is something you wouldn’t expect of a large cruiser. The exhaust note is deep and bassy, with a hint of rumble at higher revs. On the flip side, the Chieftain’s clutch feels slightly heavy, while the 6-speed gearbox calls for some effort to effect gear changes. The responsiveness of the ride-by-wire throttle also takes some getting used to. The air/oil-cooled motor tends to get hot in the city and the heat can be felt under the thighs, but the engine doesn’t threaten to roast your legs. On the fuel efficiency front, the Chieftain Dark Horse managed to return 15.30kmpl in our highway test and 13.54kmpl in the city which is fairly impressive for an 1800cc engine. And with its 20.8 litre tank, the bike thus boasts a range of nearly 300km. Swing a leg over and you feel at home on the sofa-like saddle. The curved back handlebar and forward-set footpegs result in a very relaxed riding posture. Admittedly, I was a bit overwhelmed by the bike’s kerb weight, (377kg) but as soon as I started riding it, I felt as if it had shrunk in size, as I found it surprisingly easy to maneuver. The weight has been distributed well and the bike felt rather agile even at crawling speeds. Positioning of the switchgear is ergonomic, and going through the various settings is effortless even on the go. The Chieftain’s aluminum frame is among the stiffest in its segment and is a unique modular design incorporating aluminum castings, forgings and steel elements (the rear fender acts as a structural member). A 25-degree rake angle and well-designed chassis mean you will be surprised with the bike’s handling despite its massive dimensions and weight. One does have to put in effort while entering corners but the bike holds its line well and manages to post a grin on your face around sweeping corners. Expectedly, the foot boards restrict the bike’s lean angle though, as they get grounded too soon. That said, the bike’s tight turning radius was a boon in Mumbai’s traffic, and it felt easy to negotiate through scores of cars and buses. Another very likeable aspect of the motorcycle is its supple ride quality. The Chieftain Dark Horse glided over most undulations, bumps and expansion joints, soaking them with aplomb. The front telescopic forks aren’t adjustable, but the rear monoshock is air-adjustable for preload. The Chieftain Dark Horse uses a dual-disc setup at the front and a single disc at the rear to throw the anchors. The brake lever offers good feedback, but we would have preferred some more bite. The cruiser managed an 80-0kmph time of 2.89 seconds while covering 30.50 metres in our brake test. Of course, ABS is standard and is certainly a boon. As a motorcycle, the Indian Chieftain Dark Horse is difficult to fault with. Its gorgeous styling, freight train-like torque, plethora of features, supple ride and top-notch build quality make for an awesome combination. The bike’s large dimensions, hefty kerb weight and heat from the engine are a slight issue but certainly aren’t deal breakers. Its eye-watering price of Rs 32.50 lakh ex-showroom New Delhi then is the bike’s only stumbling block. Of course, Indian Motorcycles has presence only in select cities in the country, which could be a concern. But if you look beyond the price and scarce dealer network, the Chieftain is a motorcycle that will bind you not just with its design but its performance and brilliant manners as well. At its price, the big Indian faces off not only against Harley-Davidson’s similarly specced Street Glide Custom, but Moto-Guzzi’s MGX-21 too. 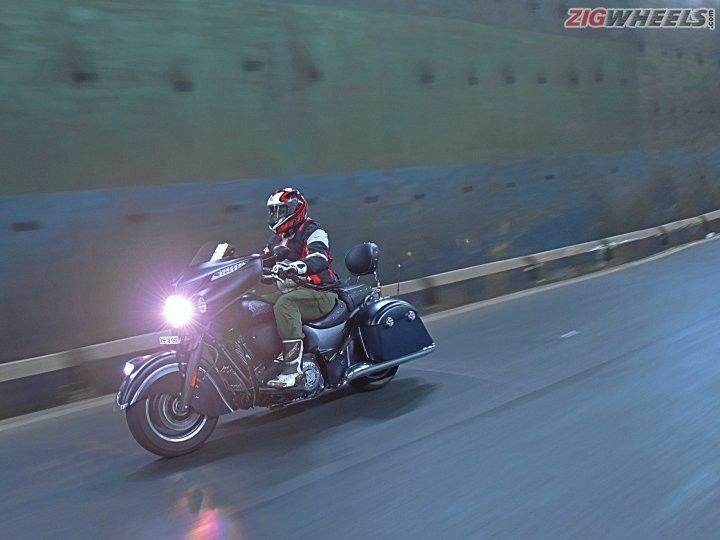 It should be interesting to see how the Indian fares against its rivals, but if you are the types to like to ‘arrive’ rather than get to a place on a motorcycle, the Indian Chieftain Dark Horse is a machine you should certainly consider. Not just for its performance and handling, but the dark aura surrounding its satin black finish as well, which sets it apart from the regular Chieftain.